During our recent mini break in Wales (see where we stayed here) we visited The Elan Valley, which is simply a place of pure beauty. Spread across 72 square miles, there are dams, reservoirs and historic landscapes to explore. We parked at the Elan Valley Visitor Centre to start our day out, as it's where the café is located and the perfect place to get up close to one of the dams. The café is pretty basic, serving hot drinks, jacket potatoes, sandwiches, pasties, soup etc., but has prime location overlooking the dam. There is also a large seating area next to the river outside, which would be such a beautiful spot to have a bite to eat in the spring/summer. There is also a gift shop, large children's play area and toilets within the visitor centre area. After having a look at the different walk routes that are available we decided to do a short walk up to the Caban Coch dam, across the river and back down the other side. The perfect little round robin route for Isabella to walk, it also had various benches to stop and take in the stunning views. It was extremely muddy though, so it's definitely one for the wellies or walking boots. We did take a little diversion and walked up the hill to get to the top of the dam, which I'd highly recommend doing if you're making a visit (you can also drive there, if you don't fancy the climb). The views from the top are breathtaking, with a hills surrounding a large reservoir, you can really feel the force of the dam. We then headed back down, walked across the bridge and headed back down the river on the other side. The walk is through woodland, then sweeps back down to a picnic area right next to the river, then along the road towards the visitor centre. After exploring Caban Coch Dam we headed along the road passed the visitor centre, which takes you through truly stunning scenery, past lots of wild sheep and to see more of the dams. Again, I would highly recommend doing this drive, as it isn't too long but takes you through a landscapes I just didn't realise existed in this country. It really reminded us of driving through parts of Iceland! We had so much fun exploring the many dams, making friends with the wild sheep and feeling so far away from the hustle and bustle of everyday life. I really look forward to visiting again in the spring/summer months, though I'm sure it would be a lot busier then. We almost had the whole place to ourselves, passing about four cars on the whole drive round. 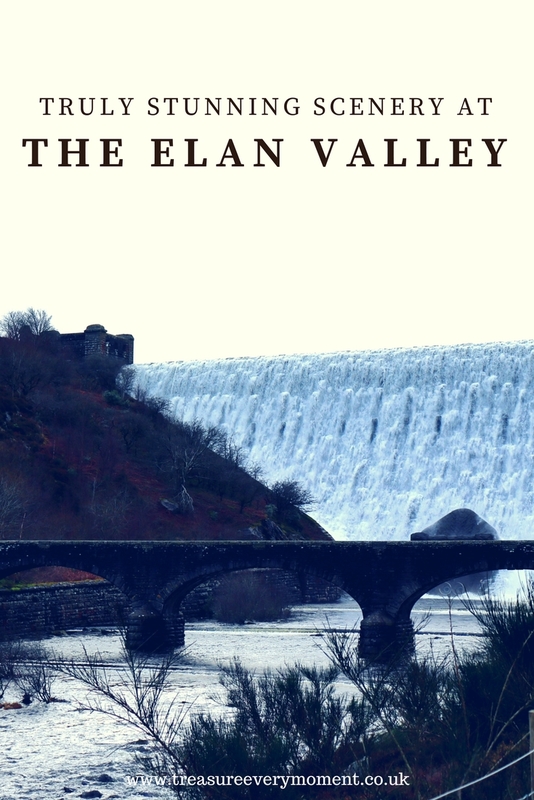 Have you visited Elan Valley? Where is your favourite stunning scenery? This looks like such a beautiful place to visit. It is amazing how much natural beauty there is in the UK. The backdrop of mountains in your photos are just stunning. Wow, that looks really stunning. I’m sure we would love to visit we’ll have to add it to our list. Wow, this looks incredible! What a stunning setting - so dramatic with the dam, I can imagine the noise was deafening! I have to admit that I'd not considered Wales for a trip, but it's just made it onto my ever expanding list. Wow what a gorgeous place to visit! Your photos are lovely! I love how you even made friends with the wild sheep. But oh my the views from the reservoir is absolutely stunning and beautiful photos too! Oh my gosh this is stunning. Those dams. I've never seen anything like it! Such a stunning place! I could probably just sit and listen to that waterfall for hours, it must be so relaxing. Gosh this looks absolutely stunning, I love your photos. It’s great when there are shorter routes that are still really interesting so the kids can enjoy the experience too. What a beautiful location - and you're right, it reminds me of Iceland too! I grew up about 45 minutes from the Welsh border and never visited; now I live 4000 miles away in Florida and am kicking myself that I didn't go when it was closer! On our next trip back home I'll add this to my list of places to visit! So beautiful! I love Wales... it is such a beautiful country! Not that I'm biased or anything. Haha! I have not visited Elan Valley but would love to. Looks great. You're right - it really does look like a place of pure beauty! Wow it's so beautiful. I bet it sounded really lovely too. I would definitely pop to the cafe for some soup to warm me up after a walk. What a gorgeous winters day out! The Elan Valley is so beautiful! We've been there a few times and I am always completely blown away by how stunning it is.